When most people think of a beautiful yard they think of lush green grass, but we are a bit harder to please. Many people are turning their attention to landscaping and patio stones for their properties. here are our 3 reasons to add natural stone to your yard. While we may not be in a drought now, it wasn’t too long ago that severe drought brought Colorado regular forest fires. By using flagstone to create beautiful patios and walkways you can dramatically cut the amount of water you use to keep your home looking amazing. Not everybody has endless hours and dollars to spend trimming their foliage and grass. Decorative stones and patios require little maintenance, and will remain just as beautiful as the day they were put in with minimal care. They aren’t called the Rocky Mountains for nothing. 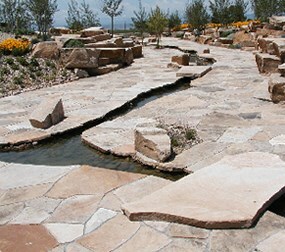 Hardscapes and landscaping rocks bring a perfect fit to the homes of colorado. We also offer a variety of stone furniture that will both fit into your landscaping and last. Not only will your home fit in, but our natural stones are all sourced from Colorado Quarries. Whether you are in Denver, Fort Collins, Colorado Springs, or elsewhere in Colorado we hope you will consider saving yourself time and money, with locally sourced natural stone from Loukonen Bros. Contact us today for a free consultation, and get building today.